This article explains how to issue a certificate or diploma for students from already prepared templates. Electa LMS provides several standard templates to use for your course certificates and diplomas. You can also create custom templates with your design and logo, see How to create custom certificate and diploma templates. Click Courses > Course Manager or (Courses > My courses). Click the red options button next to your course then click Manage Certificates. On the Issued certificates page click on the Show All Course Users tab to see all your enrolled students. Select one or more students by using the first column of your list and click the Issue button on top. You can also issue a certificate for one individual user by just clicking Issue Certificate link in the column Certificate Id. On the Issue Certificates window use the drop-down menu to select a template. 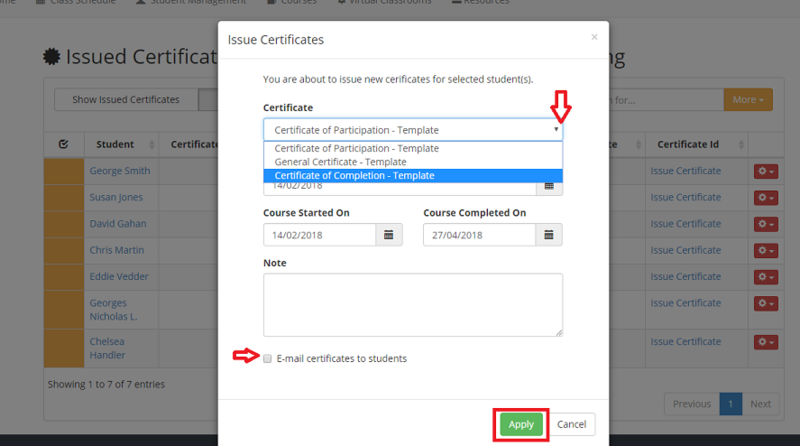 You can choose the date of the certificate, the start and completion date of your course are automatically filled, but you can change these if needed. To send links for these certificates to your students select the email option at the end of the window. Click the Apply button to finish the action. You can view your issued certificates by clicking on the Show Issued Certificates button in the above the table. You can preview each diploma by clicking on the Certificate Id link. In addition, all issued certificates for all courses are available from the main menu Courses > Issued Certificates and Diplomas. Certificates are regular PDF files. They can be downloaded and printed as regular PDFs.